By most global indicators, Singapore would probably surpass many advanced nations. For example, Singapore is considered one of the least corrupt countries in the world, it has the lowest tax rates and has the third highest per-capita gross domestic product (GDP) in the world in terms of Purchasing Power Parity. Singapore’s Oversea-Chinese Banking Corp Ltd reported a 12 percent rise in quarterly profit on Thursday, supported by robust growth in net interest income. Singapore government officials must focus on situational awareness and constant vigilance in cyber security, a GovTech official has said. SINGAPORE firms are looking towards Vietnam again, after an earlier wave of interest was disrupted by the global financial crisis and a domestic slowdown. Japanese automaker Subaru announced on Thursday (Nov 1) a worldwide recall, including in Singapore, of some of its most popular vehicles to replace a faulty engine part and repair defective multi-information displays. MBA providers are struggling to attract local students, but renewed interest from Vietnam, India, and China buoy the industry’s performance. On October 31, 2018, when the whole blockchain industry was celebrating the 10th anniversary of the launch of the Bitcoin Whitepaper, global gold industry blockchain alliance Goldlinks announced the signing of strategic partnerships with BUMO, a leading international commercial public blockchain platform, and Bizkey, the blockchain-based Asian smart POS terminal and an offline payment system using digital currencies, expanding the company’s business ecosystem. Following the series of recent executions by the state – most notably that of Malaysian Prabu N Pathmanathan who was convicted for drug trafficking – and backlash from human rights organisations, the Ministry of Home Affairs (MHA) will be carrying out a survey to study the Singaporean consensus regarding the death penalty. COME November 7, investors in Singapore with a taste for volatile trading will have more daily leverage certificates (DLCs) to choose from. DISRUPTIVE technology evolution has made a wide impact to global economies, the very first forefront business that feel this in both positive and negative way is financial service industry. Cerberus Capital Management, L.P. (“Cerberus”), a global leader in alternative investing, today announced the strategic acquisition of SGI Frontier Capital (“SGI”), a leading private equity firm focused on frontier markets in Asia and Africa. From 2020, the packaging of all tobacco products sold here will be stripped of its colour, brand images and promotional information to take on a standard look, if proposed changes to the law are passed after being tabled in Parliament early next year. SINGAPORE sovereign wealth fund GIC has made a dramatic ascent to became the world’s third most influential and powerful asset owner after two large US pension funds. The cyber attack on SingHealth’s network in June has prompted a slew of new measures at its IT vendor, including a requirement to report suspicious IT incidents within 24 hours. CONSUMERS in emerging countries are more receptive to innovation and disruption than those in developed countries – and yet, bigger marketing budgets are being thrown into media buys and product launches in developed countries. Following the latest fare increase by the Public Transport Council (PTC), the Ministry of Transport has announced that the government will be giving $9 million in vouchers to 300,000 low-income households to cope with the increase. INVESTING in unicorns – the holy grail for investors – is both challenging and risky. But this may be overcome by a systematic, diversified approach of investing with top-quartile venture capital managers, according to an exclusive report by UBS. A new blockchain platform is set to help farmers receive payments for goods more quickly, enabling parties in the supply chain to look into the sources of their commodities and make it easier for them to learn more details of their trade as well. FORGET unicorns; business-to-business (B2B) startups are where the investment opportunity now lies, said Singapore-based venture capitalists in a panel discussion at YourStory Startup Dialogue, a startup event held last week by Indian startup media platform YourStory and local public relations firm Asia PR Werkz. OCBC Bank’s digital transformation is bearing fruit, with costs down and more customers transacting online, said chief executive Samuel Tsien yesterday. When he spotted a boy with special needs in school uniform on his bus, Mr Sam Ali, 53, an SBS Transit bus captain, thought something might be amiss. While Malay heritage will be the focal point at the months-old Wisma Geylang Serai (WGS), the civic and cultural centre will also have its eye on the future. Following StarHub’s announcement earlier this month regarding the impending retrenchment of some of its staff members, the local telecommunications giant began laying off some of its 300 full-time and contract workers on Monday (29 Oct). Malaysians like to say that Singapore profits at their country’s expense. After all, Singapore buys water from Malaysia at a seemingly low price. StarHub will be pulling the plug on its cable services by June 30 next year, the telco said yesterday. But it was only years after joining as a Singapore Red Cross (SRC) volunteer in 2005 did Mr Wong Leong Jeam, 67, realise he could also make them smile. A new fully digitalised sales booking platform now operational could save hundreds of thousands of sheets of paper for developers and property agents at a single project. Electricity retailers reported brisk sign-up rates since the launch of the open electricity market yesterday, with three saying that response was overwhelming. Singapore is going to be wet for the first half of November 2018, the Meteorological Service Singapore (MSS) said on Thursday, Nov. 1. The majority of Millennials in Singapore perceive short-term life goals such as creating an Instagram-worthy home as being more important than saving for retirement, according to a survey commissioned by financial services group Manulife. From September 3, 2019, Singapore Airlines (SIA) will be launching a non-stop flight to Seattle in the US State of Washington. An e-bike rider was caught on video travelling along the Seletar Expressway (SLE) towards the Bukit Timah Expressway (BKE). German exchange group Deutsche Boerse is revamping its Asian business with the launch of its European Energy Exchange (EEX) in Singapore, looking to boost its business in the world’s fastest growing commodity markets. 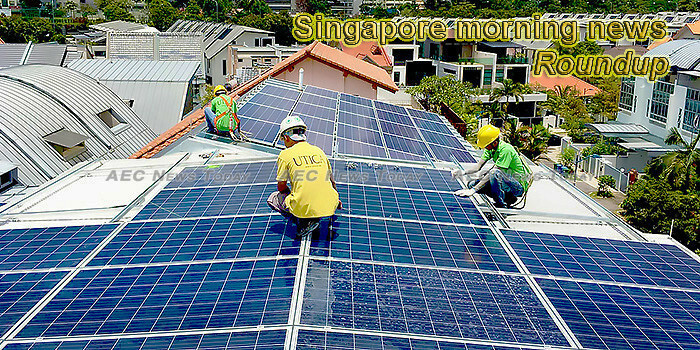 This week’s Singapore morning news feature photo acknowledges World Cities Day, October 31.